It’s not every day that an entire community unites to support one cause. 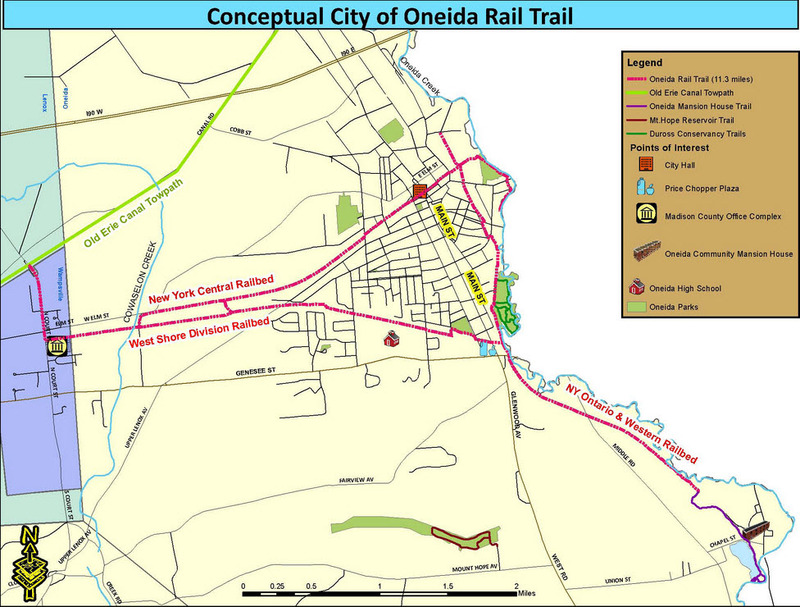 So when the residents and business owners of the City of Oneida rallied behind the Oneida Improvement Committee (OIC) during the Central New York Community Foundation’s CNY85 online voting competition, in support of a new recreational “rail trail” system, it made quite the impact. In celebration of its 85-year anniversary, the Central New York Community Foundation hosted The CNY85 Giving Project to recognize the many impactful projects of the Central New York nonprofit community. Over the course of 2012, the project awarded grants to four deserving nonprofit organizations working to improve the qu ality of life in Central New York as demonstrated by our collaborative community indicators project, CNYVitals. Members of the Oneida community joined forces to support the OIC which successfully garnered the most public votes in the CNY85 Giving Project’s final round of organizations within the categories of arts, culture, recreation and civic engagement. They received an $8,500 grant to begin their intended project. With the assistance of the CNYCF grant, the committee’s hope of repurposing existing historic asset rail beds, as a new community destination that will eventually circle the City, has become a reality. The grant enabled the OIC to recruit volunteers, design signage and work with local government, utility companies and homeowners to bring the trails to fruition. The 11.3-mile non-motorized, multi-use recreational trail located in the City of Oneida will benefit all who utilize its paths by connecting shopping, neighborhoods, schools and parks. The OIC predicts that the new trail system will generate economic development, enhance the community’s quality of life and good health, improve the local environment, develop civic engagement, and preserve the area’s heritage. Hundreds of volunteers and committee members have been working tirelessly all year long to get the first 1-mile section of the trail completed for fall. On September 8, at 6:00 p.m. a ribbon-cutting celebration will take place at the new trailhead along Hubbard Place. Attendees will be welcomed with opening remarks by Mayor Max Smith and a guided walking tour by local rail historian John Taibi. The Oneida Improvement Committee will also be holding a clean-up event on Saturday, September 6th from 9:00 a.m. to noon to get the section ready for opening. During the clean-up event, volunteers can help install gates at both ends of the trail, trail markers, and the trailhead sign. The 1 mile section stretches from Hubbard Place along a former rail bed east to Lenox Avenue with parking along Hubbard Place. Eventually, the trail will cross Lenox Avenue and continue east, but for now it is an out-and-back. The trail will be open for hiking and biking as well as cross-country skiing and snow shoeing in the winter. Leashed pets are also welcome on the trail.